Feedback Return Conveyors are designed to handle the fast pace of end-to-end feeding on Shapers/Sanders and Edge Foilers. Suiteble for all models and feed rates. 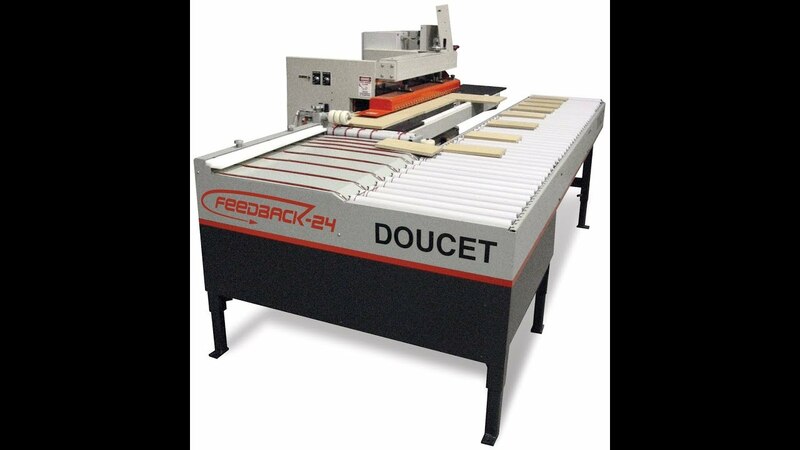 Specially design to handle the fast pace of end-to-end feeding on Shapers/Sanders and Edge Foilers, Doucet Feedback Return Conveyors will give you the leading edge in today's competitive environment. Feed rollers, driven by a variable speed motor, guide the part onto the receiving module. A set of top rollers issues a smooth transfer on the receiving module. Pieces entering the receiving table are supported by an adjustable ledge in the continuation of the reference fence. Polymer belts side-shift the panels to the return rollers quickly and efficiently. The return rollers are individually driven by welded urethane belts. These rollers are 2 inches lower than the pass height of the shaper, so parts can travel in opposite directions without interference. The transfer process occurs on a continuous basis, eliminating functional limitations typical of return devices with multiple "cycle" steps. Standard module length is 36" or 60"